David Horowitz: "The issue is not the issue..."
In researching my previous post, I came across this interview (published over the weekend) that Newsmax did with David Horowitz. David talks about his new book, The End of Time, and about the frightening reality of enemies among us. "The issue is never the issue, the revolution is the issue." That's the way I look at this. This is a power struggle. It's not about judges, it's not about abortion - it's to stop the Bush agenda. But that's not what their agenda is. The way they see it is, ‘My God, if the party of Satan gets a black woman in there, they will fool people into thinking they are not the party of Satan.' So the cause is what it's about. The issue is never the issue, the issue is always the revolution. David was prompted to write his most recent book, in some measure, by his personal fight against prostate cancer. All of it was great. For me, hearing actor Charles Durning recount the story of Corpsman Danny Thomas and his experiences on Iwo Jima was especially moving. God Bless our veterans and all the men and women in uniform that serve around the world. I've been reading a fascinating book by a neurologist on the workings of the brain (which I intend to review sometime in the near future). Temporal Lobe Personality: Patients have heightened emotions and see cosmic significance in trivial events. It is claimed that they tend to be humorless, full of self-importance, and to maintain elaborate diaries that record quotidian events in elaborate detail - a trait called hypergraphia... Some of these patients are sticky in conversation, argumentative, pedantic, and egocentric, ...and they are obsessively preoccupied with philosophical and theological issues. My first thought was "OMG, it's a diagnosis for the blogosphere!" I've been thinking some today about what I wanted to post for Memorial Day. Some good remembrance - something that reminds me of how thankful I am for those who are willing to pay the ultimate sacrifice on the altar of freedom so that tomorrow, you and I and our friends can enjoy the gratuitous cookout and safely enjoy our friends and families. I can say not only that I was able to serve with Antoine [Smith], but I knew him well. He was my brother. We served together as riflemen in 1st platoon 1st squad. Smith used to call us "team vick-smyth" like "Ram-Rod" from a movie that he enjoyed. On Nov. 15 I was not with Smith when he was hit. I was directly across the street. When we heard the gunfire, and the news that one of ours had been hit, we went in to retrieve our fallen brother. "Team punishment" lead by Lcpl. Rick Meyers, under the direction of Sqd. leader Cpl. Worthy, endered the courtyard of the house. I was the first to see Smith. If you can ever imagine how it is portrayed in movies, where everything is happening way to fast, yet in slow motion at the same time. Or everything is so loud yet dead silent all at once, that's how the world was. As I carried my brother out of that courtyard, my team proceeded to destroy the six evil cowards that had taken one of our brave heroes. Mrs. Smith, I thank you for giving us all a chance to know your son, our brother. Semper Fi Antoine. May you guard the streets of heaven as fiercly as we stormed the streets of hell. Lance Corporal Vick, I can only offer the ovewhelmed gratitude of a grateful nation. May God bless you richly and may you know this Memorial Day the honor with which we hold you and your brothers. UPDATE: Michelle Malkin has a Memorial Day remembrance post. Antoine Smith is memorialized from a link she referenced and it is here. Friend McGehee has a good round up post here. Washington state GOP Chairman provided this update for the end of the week in the election contest trial - the trial resumes on Tuesday, May, 31st. Earlier today, Chelan County Superior Court Judge John Bridges denied a motion by the Democrats to dismiss the Republicans’ election contest. The ruling was yet another defeat for the Democrats, who have attempted to suppress evidence and witnesses throughout the week. - Evidence shows that 789 felons, dead people, and double-voters illegally voted in the 2004 election. People who cast ballots in the names of dead people, or convicted felons who voted without their rights restored, and those who voted more than once, did so illegally. - King County cannot reconcile its voting records. 1,156 more ballots were counted by Accuvote machines at polling places throughout the county than can be attached to any voters. - 875 more absentee ballots were counted in King County than voters documented as having voted. In addition, King County Absentee Ballot Supervisor Nicole Way acknowledged that the County did not know how many absentee ballots were returned and that the system could not keep track of ballots. - King County could not provide an audit trail of the number of ballots printed, issued, or returned. The absentee ballot report, which included numbers that the people who composed it knew were not accurate, was submitted to the canvassing board without the board's knowledge. - Because of the major discrepancies and errors which are well outside the margin of 129 vote victory; no one knows who received the most votes in the governor’s election. - This case has similar circumstances to those of Foulkes v Hayes. They share the same construction, in that if neglect of elections officials renders it impossible to know who received the most legal votes, then the election must be set aside. The same conditions can be seen in this case: neglect and error by elections officials produced 785 unverified provisional ballots, a surplus of 875 absentee ballots, 96 uncounted absentee ballots, and hundreds more improperly counted poll ballots. - The “proportional deduction” method that was presented in court and was approved by two noted professors, has been used by U.S. Congress and jurisdictions around the country to determine the outcome of other close elections. Applying this method, Dino Rossi wins. - The Democrats’ contention that the names of people who voted illegally needs to be known is a "tortured reading of contest statute", inconsistent with the Foulkes case. Under the Democrats interpretation of the law, it would be impossible to contest an election based on the stuffing of ballot boxes, because it would be impossible to attach names to the illegally added ballots. - If the court had dismissed this case, with such knowledge of overwhelming error and neglect, the State of Washington would no longer have had a meaningful election contest statue. On the Dem claim that names of people who voted illegally need to be known also violates the secrecy of the ballot. There is no possible interpretation of any law that would abrogate the guarantee of ballot secrecy. Perhaps the Democrats would like to have their own Vote Police at the polling places that will record your name and go with you into the ballot box and record your ballot as well. Day Four was data day. The Democrats began the day by cross-examining Clark Bensen about the data he compiled for the experts. The Republicans then called Jonathan Katz, their first expert. When Professor Katz took the stand, the Democrats objected to his testimony and called for a "Frye hearing" to determine whether his testimony satisfied the threshold of scientific validity for use by the court. The ensuing hearing lasted 3 hours, during which time Professor Katz testified about his qualifications and the Democrats' two experts testified about their criticism of Professor Katz's report. On cross examination, the Democrats' first expert testified that it is impossible to know how the illegal votes were cast and, therefore, who won the election. At the conclusion of the Frye hearing, the judge decided to hear the testimony from the experts but defer his ruling on whether they satisfied the Frye standard. Professor Katz and the Republicans' other expert, Professor Anthony Gill, then testified about how they had analyzed the election result data files and illegal votes to deduct illegal votes from the election results based on a proportional analysis. Their expert reports were placed into the record. After the testimony of the experts, the Republicans read into the record the brief deposition of Vern Witte, who decribed how someone had cast a ballot in his wife's name. On Friday, the Republicans will introduce some additional documentary evidence and then rest their case, at which time the Democrats will move to dismiss the case on the grounds that the Republicans have not presented sufficient evidence to overturn the election; even in the absence of contrary evidence from the Democrats. Wednesday was an eventful and successful day in the election contest trial. The Republicans called Nicole Way, supervisor of absentee ballot processing for King County, as the day's first witness. She testified about her concerns that King County's computer system could not track absentee ballots sent or received, and the discussions she had with Garth Fell and Bill Huennekens about her concerns. The Republican lawyers showed her some absentee ballot batch slips and the "accountability" spreadsheet King County prepared that summarized all of the batch slips -- and the many discrepancies and errors involved in them -- and had her explain them to the court. When the Republicans offered the accountability spreadsheet as evidence, the Democrats objected vigorously. This was the latest instance of their strategy to stop evidence about the election from being heard -- a trend that continued throughout the day (the judge agreed with the Republicans and accepted the spreadsheet into evidence). Ms. Way confirmed (yet again) that the infamous Mail Ballot Report did not do what the law requires, which is to verify that the number of absentee ballots received was the same as the total of the number counted plus the number rejected. The number received shown on the report was merely the sum of the numbers counted and rejected, not an independent check on them. The Democrats cross-examined Ms. Way, trying to establish that ballots were secure and that any fraud or misconduct would have been detected. They also asked if the mail ballot report had always been prepared this way. She said it had not (and later expanded that by saying that in the past the computer system produced a report showing the number issued and the number credited, which could be compared to the report of the number tabulated and the daily log of the number sent and received). The Democrats also asked her questions about the no signature on file ("Larry Phillips") ballots. When she admitted to a Republican lawyer that one reason voter records might not have a signature is that the voter did not sign their application, the lawyer for the Secretary of State asked whether unsigned applications would be processed (implying they would not). Ms. Way said she had seen actual original copies of registration applications that were processed even though they were not signed. After Ms. Way's (long) testimony, the Republicans called Clark Bensen. Mr. Bensen testified about his collection of data relating to the 2004 election and about two aspects of the data he reviewed -- that there were 875 more absentee ballots counted than absentee voters credited in King County, and that most of the precincts with the largest surplus of ballots were won by Christine Gregoire, while most of the precincts with the largest surplus of credits were won by Dino Rossi. We believe this non-random pattern of discrepancies is strong evidence that fraud may have occurred. The Democrats objected strenuously at every stage of this questioning, seeking to bar Mr. Bensen from testifying, to bar him from talking about the 875 vote absentee discrepancy, to bar him from talking about the precincts with the largest differences, and to bar him from using visual aids to explain the data he testified about to the court. The Democrats also complained that they had not been advised of Mr. Bensen's work on voter crediting, notwithstanding that they questioned him about it during his deposition. The lawyer for the Secretary of State objected that voter crediting information could not be used to prove anything about who voted or how many people voted. Today, the Democrats will cross-examine Mr. Bensen. There will then be a "Frye hearing" where the Democrats will seek to prevent testimony by the Republicans' experts. Assuming the judge agrees to hear the testimony, it will follow the hearing. Depending on the timing of the testimony (and how many more objections the Democrats make), the Republicans expect to complete their case Thursday afternoon or Friday morning. It's worth discussing a little about what is going on here. It continues to appear that the Democrat legal strategists have been believing the LSMs and their own press clippings since the contest was announced - that the legal case is essentially just about the tabulation of illegal votes and argument about who would have received more or less votes on that basis. Neither the press nor the Democrats have been prepared to hear specific allegations of fraud. The Republicans, for their part, did not do any particular telegraphing about it and now the Democrats are left just attempting to keep the evidence that has been uncovered from being presented. 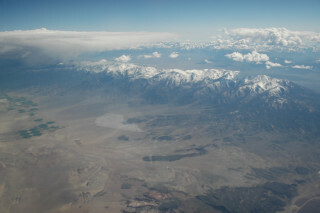 Somewhere south of Oregon the mountains merge with the desert. 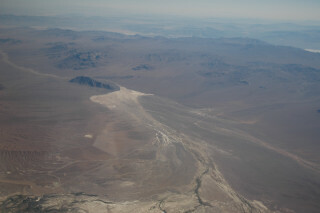 Salt or alkaloid flats abound, dry rivers and creeks look like American Nazca lines. ...Continue reading "Travelogue - Cal/Neva?"